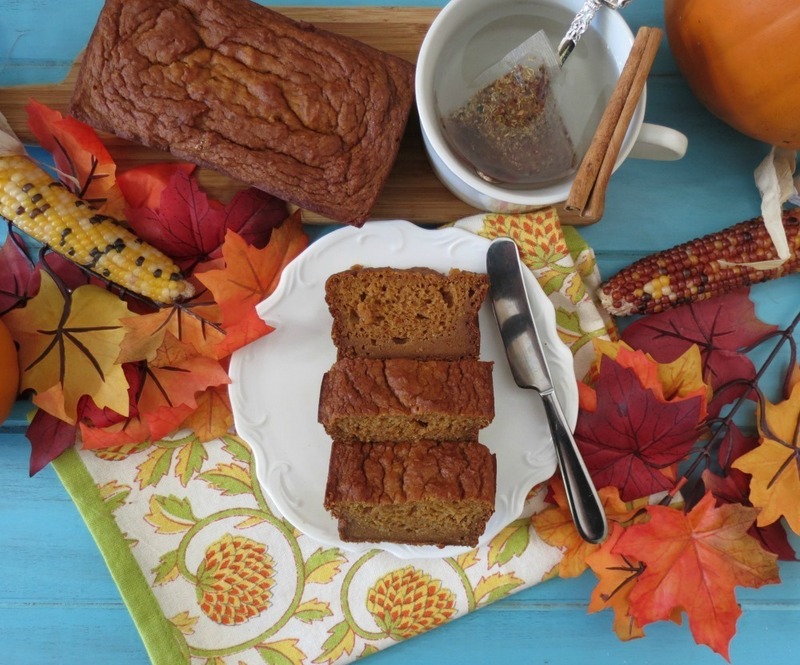 Yes I am back with yet another pumpkin bread recipe. 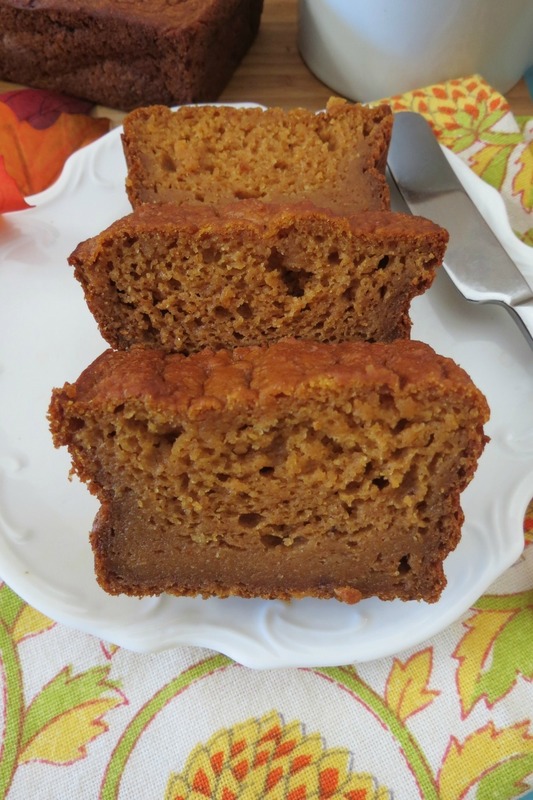 I was going through all of my pumpkin recipes and one pumpkin bread that remained un-made was plain pumpkin bread. How crazy is that? Funny, you always want to change things up, stay away from the plain and make something that will stand out from the crowd. 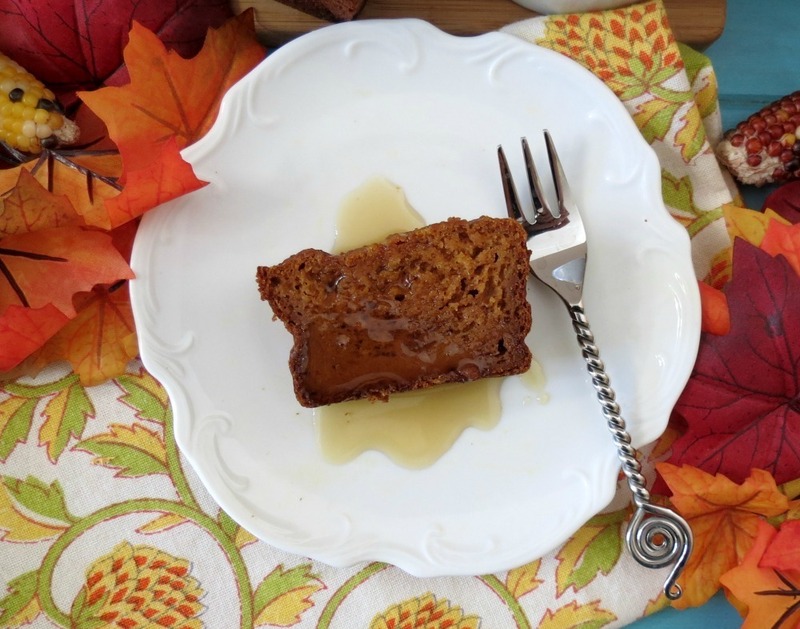 Well, this little pumpkin bread does just that! It may not have nuts or chocolate or cranberries, but one thing that it does have that will by-pass the others is flavor!!! Not only does this bread have flavor it is so moist it melts in your mouth!! But one thing this bread does not contain is eggs. Yupper Doodles, no eggs! I thought I would try something new, well I didn’t plan this since I was out of eggs and I wanted pumpkin bread, I thought hey, I’ll give it a shot! It turned out perfect, way better than I could have imagined!!! The bread is a little heavy, but not chewy, not dry and certainly has pumpkin flavor busting out all over the place! 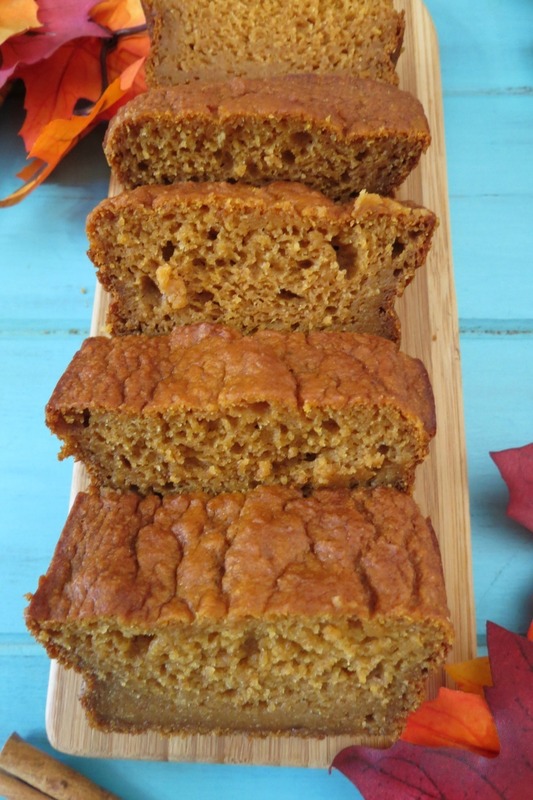 So if you want pumpkin bread but are out of eggs, don’t fret give this recipe a try!! Since I didn’t use eggs, I had to cut back on flour, because there wouldn’t be enough moister in the bread, therefore the bread does turn out a little flat on top, but that’s ok! If you wanted to add a vanilla or spice glaze over the top it will hold it’s place, since it won’t roll off the bread. Plus having less flour means less carbs and fewer calories. Ready for this? Each piece of bread has, are you sitting down? 66 calories! Yes, you read that correct, 66 calories! Now you can have like 3 slices and not feel bad!! I ate two while photographing this recipe. 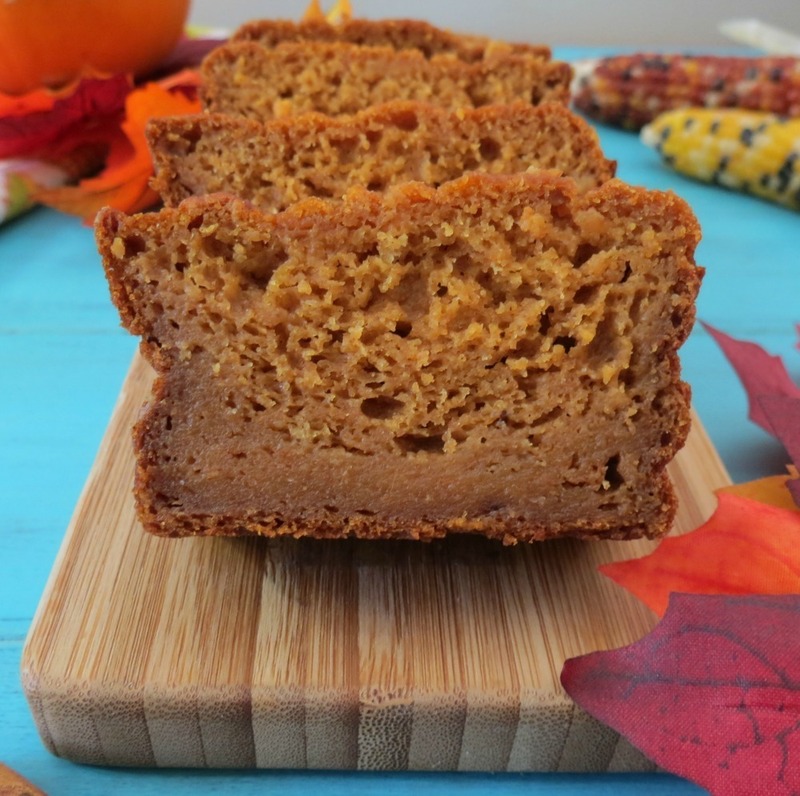 A moist, melt in your mouth pumpkin flavored bread that contains no eggs, just lots of flavor and only 66 calories a slice!! In a bowl, add sugar, pumpkin, applesauce, yogurt, vanilla extract and butter infused olive oil. Whisk until combined. Add cinnamon, ground cloves and pumpkin spice; mix well. Slowly add flour mixture to the pumpkin mixture and fold together until combined. Do not over mix. Bake mini loafs for 30 - 35 minutes, bake large loaf for 50 - 60 minutes. Insert a toothpick into center of bread, comes out clean, bread is done. Note: if the edges start to turn brown before bread is done, just lightly wrap a piece of aluminium foil around the edges. I am just so pleased on how well this bread turned out! It’s just perfect!! I love how low-calorie it is! If you are vegan, you could sub the yogurt for soy yogurt or I am betting coconut or almond milk will probably work well too!!! When making this recipe, I made three mini loafs, one for eating now and the two for later this week! 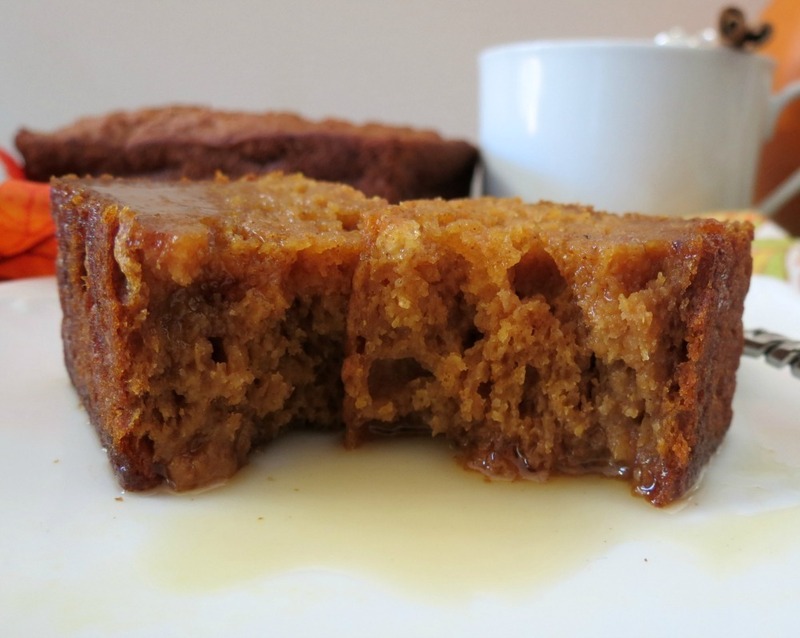 Plus I have a recipe in mind with using my pumpkin bread, but that will come later! he he Just look at the bread, yummy! Don’t tell anyone, but I drizzled some maple syrup on the bread and oh my gosh it tasted amazing!!!!!!!!! When is this pumpkin train going to end? Hopefully not for a long time!! What a beautiful loaf and so so so moist!! I’m not real familiar with tagatose but can I use stevia instead? This looks delicious! It looks really moist Jennifer and for 66 calories I could definitely for go the egg! I want to try this! I love your recipes, keep it up! This is fabulous! I think I’ll work with this recipe and try to use coconut flour somehow since I’m gluten-free, but I LOVE the ingredients you used!! :) It looks so tasty! I bet coocnut flour would be great in this recipe. If you try it out with a different flour, let me know how it turns out. Is there a substitute for apple sauce and can i use fresh grated pumpin ? Hi Manishaa, I am not sure how that would work out, but I say give it a try or just add more pumpkin. Is there a substitute I could use for the Greek yogurt? I would probably use sour cream in place of greek yogurt. Does the pumpkin spice mix you used also have clove in it? Wondering if you added extra ground clove or if you included it in the recipe because it wasn’t in the spice mix. Thank you! Good question! I forgot why I did that? You can skip the cinnamon & clove, and just use the pumpkin spice in replace of it. Pumpkin Spice does have clove in it. Great! Thank you for your prompt reply. Looking forward to making it this weekend!